Harold William John (Bill) Stanaway was born in Tangowahine on 11 May 1899 and the first child of Charles George and Elizabeth (Birth Certificate number 1899/4435). Not much is known of Bill’s childhood but we can assume it was much the same as his siblings and other children at that time. Bill meets and marries _________ in _________ at _________ (Marriage Certificate Number ____). Craneman Injures Hand. – Just after one o clock this afternoon Harold Stanaway, a craneman in the employ of the Auckland Harbour Board, got his right hand caught in the gear of one of the cranes, and had it crushed severely. Stanaway, who is a married man, residing in Prospect Terrace, Ponsonby, was conveyed to hospital. William began his career in the rafting business on the Northern Wairoa. Later he transferred to the Waitemata, where he had his own launch for a period. During the second world war he had a tour of duty with the Americans. When William returned from overseas service he obtained a post with the Auckland branch of the Marine Dept. where he remained for 20 years until his retirement in 1964. Bill also served his time on the Kaipara. He was very mechanically minded, and started out tendering to any machinery onboard the local boats. I imagine he was brought up in an environment where he learned all sorts of skills, and could get things going and fixed up with very little resources. I am unaware if he held any official tickets, or had any in-depth knowledge of steam propulsion. He worked for a time at Kaipara Towing, and looked after their fleet of raft tugs, which were used for towing kauri logs. He moved to Auckland in the late 1920’s and became skipper. When Bill first moved to Auckland he purchased the launch “Idler”. She was registered as an OEV launch and may have been powered by an early diesel engine. He specialised in towing work and set up the Waitemata Barging Company. He later ran the “Curlew”, the “Waikeri” and the “Waihau”. The “Waihau” made her name as a tug on the West Coast of the South Island at Jackson’s Bay during the Hasst Pass roading project. In 1938 Bill sold up and became a launch man for the Auckland Harbour Board. He gained much respect during the Second World War when a fleet of vessels left New Zealand shores on an undercover military operation to service Northern Australia. The vessels were taken over by the American military for war duty in the islands off Souh East Asia. He was posted as second engineer on the 109 ton auxiliary schooner “Miena”, which sailed in a fleet consisting of the scow “Altair”, the “Will Watch”, the “Haere” and the small steamer “Bell Bird”, formerly the “Kaipara”. The vessels sailed for Sydney, with the trip taking 10-11 days, and from there they went up the coast to Townsville. On their arrival the ships were re-appointed under American command. Bill was posted as the skipper of the tub “Forster”, and carried out towing work between Cairns and New Guinea and out to the Great Barrier Reef. He gained great respect from the Americans, and when he was discharged after the war he was given a much deserved reference for his outstanding duty. 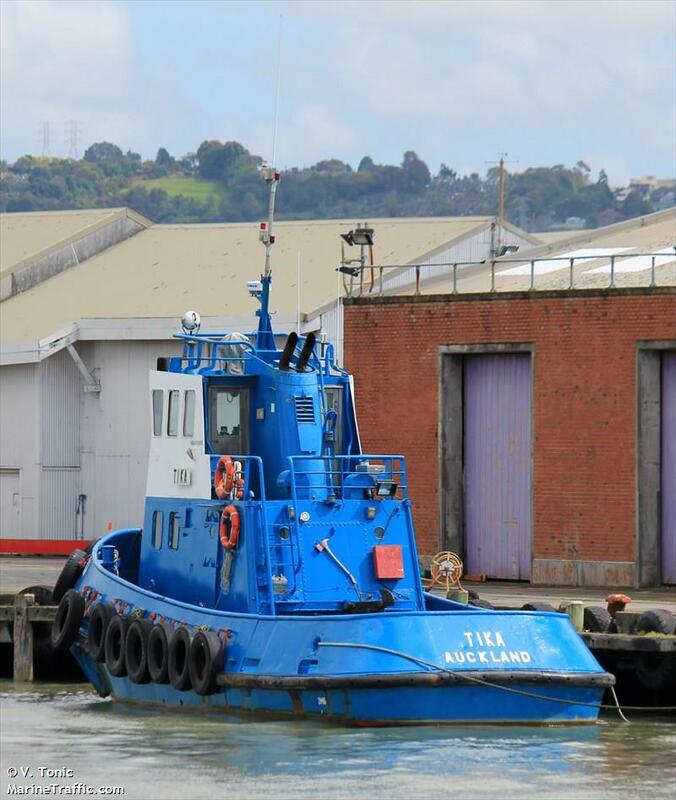 When Bill Stanaway returned to Auckland he took on another role with the Auckland branch of the Marine Department as master of the former naval tug “Manawanui” (number 622). He maintained and managed their fleet, including many surplus vessels that served during the war years. One of the more memorable and much photographed activities was the disposal of the old battleship “HMS Philomel” which was towed to sea and sunk. He and his crew also repeated this activity with the sinking of the oild tanker “Nucula”. Bill spent a total of 20 years with the Marine Department, and the wide range of duties he carried out made him one of the most versatile and well-rounded skippers in New Zealand. In short, these duties included servicing the lighthouses around the Hauraki Golf, being a fishing inspector, carrying out police work and general towing duties. He was a crewmember for Ivan Anderson on a vessel for the police when they were asked by the Marine Department to seize the “Ruawai”. The funny thing about that operation was that Harry (his brother) was the skipper of the “Ruawai”. Bill never had any interest in the big shipping scene, and was happy to play around close to home in small boats. He was known as “Loadine Bill” to most people who worked on the Auckland waterfront. Bill had two sons, Harold, known as Digger, and Gordon, or Beau. Digger follwed in his father’s footsteps and started out as an engineer on board the former naval tug “Manawanu”. ……. Digger had two sons, Jim and David, who both took to the sea without any hesitation. Meanwhile, Beau started his carrer as a seaman with the Union Steamship Company. He worked his way up to AB on the “Wairemu” while she was running to South East Asia. In 1956 he joined Parry Bros, and skippered their auxiliary scow “Sea Gull” during her final years…..In about 1965 he joined Digger to help with his new venture, the Tiri Co-op Shipping Company. Editors Note – The scow Sea Gull was formally skippered by Captain Charles Daniel, husband of Ida Stanaway. Captain Daniel also worked for the Marine Department, just before Bill also servicing the light houses and as the chief Fisheries Inspector around the Hauraki Golf. He then went to work for the Auckland Harbour Board, who required a well-rounded and versatile skipper for their fleet of launches. Around this time they were building a new tug, the “Tika”, and Beau put his hand up for the job. He took command of this new vessel on her launchinig day and remained as skipper until 1982, when a tragic accident occured. The “Tika” was assisting the 1433 ton freighter “Shereen” from Wynyard Wharf late one afternoon when the event took place. The “Tika” had assisted her tow to mid-harbour position and was about to release the line. Before the tug could release the tow the “Shereen” was underway ahead. The “Tika” began to lose control of her positioning with the “Shereen”, and as a result was pulled over. For some reason her emergency tow release did not function. The deckhand, Allan Wallace, managed to scramble to safety overboard, but Beau was trapped in the wheelhouse. In a matter of minutes the “Tika” was belly up in the harbour, still attached to the “Shereen”. As a result Beau lost his life……….